Bike Lanes and shoulders are nice and even appropriate for very low traffic roads with 30 mph or less speeds. However, most average people do not like to mix with cars, even in a bike lane. In winter most bike lanes become quite dangerous and unusable due to accumulated snow, muck, and debris. Segregated paths are safer and most importantly, feel safer, and are more comfortable and enjoyable. 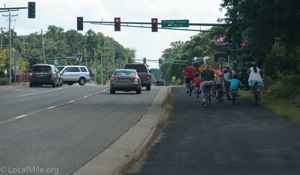 Segregated paths are the appropriate facility for any roadway corridor with greater than 30 mph traffic. They can also be kept clear and safe throughout the winter, unlike bike lanes. 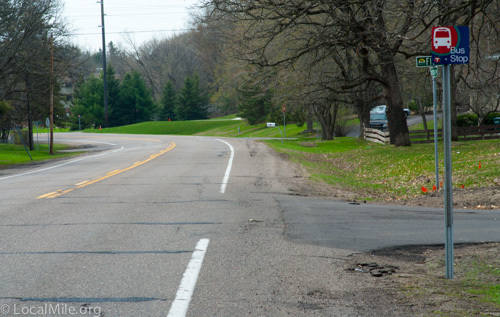 The most urgent need in Shoreview are major county roads such as Hodgson Road south of 96 (above), Victoria, …. that have no appropriate bicycling or pedestrian facilities. In addition are a few that need upgrades to current facilities. Tanglewood, above, has a cement sidewalk as well as wide and smooth shoulders that serve as fairly good bike lanes. However, many people do not like to ride on these shoulders and many parents instruct their children not to ride on them. The result is people choosing either not to ride or riding on the sidewalk which results in congestion and safety issues since it is not designed for bicycle traffic. 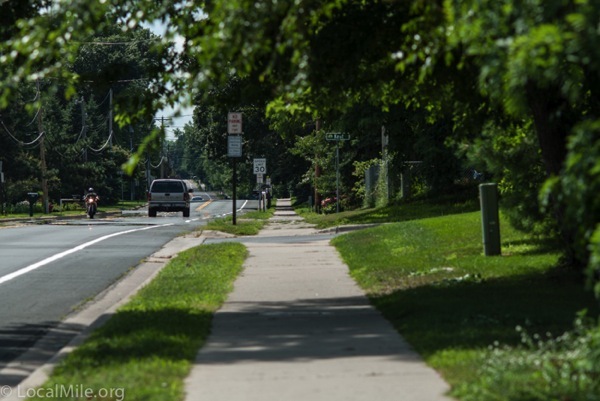 Though a fairly low priority, Shoreview should upgrade Tanglewood with either the addition of a proper cycle track or modify the sidewalk to a ten or twelve foot wide MUP. 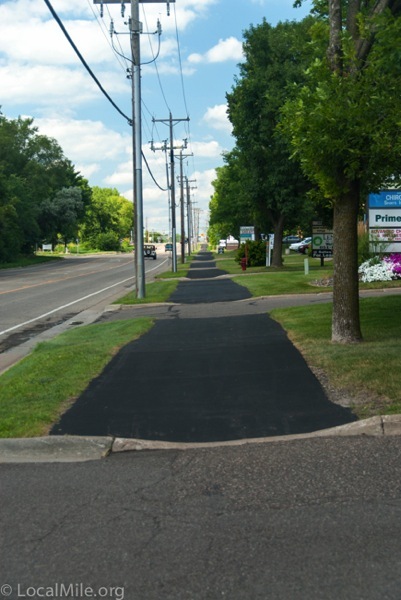 Shoreview should also consider separating pedestrian and bicycle paths along some heavier used corridors or, where that is not possible, widening the multi-use paths to 12 or 14 feet. 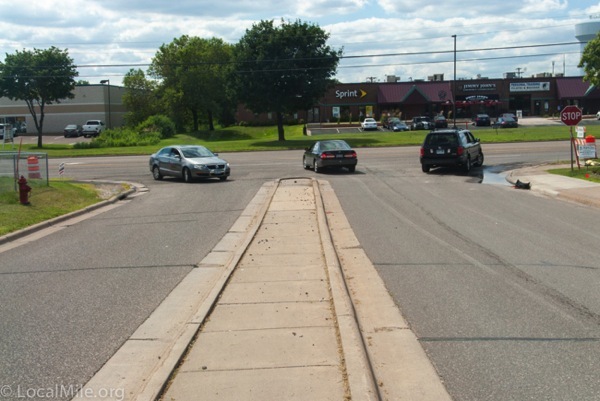 Some MUPs can already get somewhat congested at times and this congestion will only get worse in coming years as more people in Shoreview begin to walk and ride more often. Perhaps the two most critical sections are Hodgson Road between 96 and Hodgson Connection, and Lexington between F and 694. There are two issues with current crossings: motorists are provided no indication of the existence of the path or of who has right-of-way which makes these dangerous for pedestrians and people riding bicycles, and the use of formed curb cuts is quite uncomfortable for people riding bicycles to humpity-bump over and the narrowness of the actual cut effectively narrows the path causing a danger for all users as they veer to the narrow center. The crossing above, along with Kozlak’s and Turtle Lake Park, are the most dangerous that I encounter on my routine ride down Hodgson Road. I and others have encountered numerous people entering or leaving these without looking or stopping. Below is the same crossing from a motorist’s perspective—note the lack of any indication that a path exists or that the motorist should do anything other than look out for other cars. While many drivers are aware of the path, and do a good job of stoping at the stop sign and looking for people on the path, too many do not or are paying more attention to their cell phones than path users. Generally, path traffic should follow the same traffic flow as the adjacent roadway. If traffic on the roadway has right-of-way, traffic on the pathway should as well. Paths should ideally be continuous between controlled intersections (those with stop signs or lights) in grade, material, color, and width. Driveways (residential & commercial) and minor roads should meet the path, not go through it. This provides motorists with an indication that the path exists, makes it more evident who has right-of-way, and is a safer surface for cyclists by eliminating the problems of the jarring bumps and narrowing of ridable path areas at curb cuts. Notice all of the driveway crossings on this section of the Lexington Ave path just north of Cannon Ave. Besides the lack of any clear indication for motorists of the existence of the path or of right-of-way, several of these involve quite jarring bumps for people riding bicycles. Just imagine driving along something like this in a car, even with good suspension. For the approximately 25 minutes I was taking these photos, 13 cyclists rode (or jarringly bumped) along this path as well as 3 pedestrians. Of the 5 cars that crossed the path during this time, 2 had no interactions with path users, 2 stopped to let cyclists continue, and 1 crossed directly in front of two young girls riding their bikes who had to stop to keep from being hit by the car. Several of the bicyclists went off the path and in to the roadway to avoid this path. This path should continue through as a continuous element with each of the drives meeting the path instead of the other way around. This would provide a much safer surface for pedestrians and bicyclists and would advise motorists of the existence of the path and who has right-of-way. Finally, Shoreview (or Ramsey County?) deserves some credit for filling in some of the most jarring bumps with a bit of extra asphalt. There are a number of elements of controlled intersections (those with stop signs or lights) that are problematic for people riding bicycles—from motorists making right turns on red without slowing, stopping or looking, to difficult to access crossing buttons. The good news is that according to most safety studies, intersections do not appear to be a significant risk for bicyclists who obey the law. That said, intersections can still feel quite unsafe for many people and poor design can encourage pedestrians and bicyclists to shortcut safety measures. Crossing Placement – Moving the crossings and stop lines back several feet from the apex of the corner helps in a number of ways. Primarily, it places pedestrians and cyclists ready to cross within the natural field of view of turning motorists (red line below) instead of off to the side and out of motorists natural field of view. It also makes it more clear to motorists if someone will be crossing and in what direction as well as eliminating the issue of someone crossing one street and immediately making a right or left turn to cross the next (instead they complete crossing one street and then walk a brief way diagonally to position themselves for the next crossing). Protected Turns – Eliminating right-on-red is perhaps one of the best methods of dealing with the rolling right turns. The best and safest method is a red arrow that makes this very clear to motorists, second best is a no-turn-on-red sign. Neither of these is 100%, though the red arrow seems to be much more effective than the sign. Curb Cuts – At most intersections, bicyclists must navigate a pedestrian / ADA curb-cut from the path to the roadway. There are three elements of these that are problematic for cyclists. Perhaps the biggest safety issue is that many of these are not full path width and force bicyclists to move to the center to avoid having to jump a curb. This squeezing of all pedestrians and bicyclists together can be dangerous (though likely never resulting in more than minor cuts or scrapes) and uncomfortable. 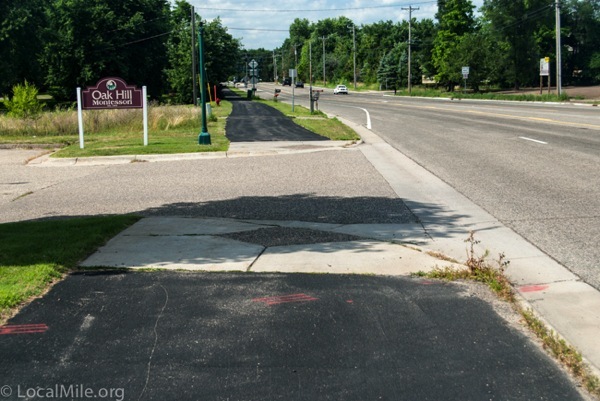 Second, these curb cuts do not provide a smooth transition, but instead a jarring bump that is not only uncomfortable but also dangerous for some riders. Third, the anti-skid surface can be problematic for some bicyclists. Crossing Button Placement – Many crossing buttons are in locations that make them difficult to access without the bicyclist either getting off of their bike, backing up, or making numerous forward/backward motions to realign themselves for crossing. In case you’re not familiar with bicycles, they don’t have a very good reverse. While button placement may not be much of an issue for someone who rides six times per year, they are significant issue for those who ride through these intersections frequently and often numerous such intersections per trip. This crossing below, of Hodgson Road at Village Center Drive, is a good example. To cross properly a person riding a bicycle must ride over to the button on the post to the right and then back up a considerable distance to align themselves with the narrow curb cut (roughly the center five feet of the crossing paint). Potential solutions include placing the buttons along the bicyclists forward path of travel, installing sensors so that pushing the buttons is no longer necessary, or including crossing phases in every signal cycle. Buttons for coordinated left turns (e.g., pressing one button provides for crossing straight ahead and then crossing the adjacent roadway) would also help as this second button is the most difficult to reach given the bicyclists direction of travel. Note also that moving the crossing and stop lines back from the intersection (further to the right in the picture above) would provide greater safety and allow for better placement of crossing buttons. Providing ‘ride-by’ buttons several feet before an intersection that allow bicyclists to more easily hit the button while riding and have the crossing change before their arrival, whenever possible, is a huge benefit in reducing the number of stops and starts (imagine if, when driving your car, you had to stop at EVERY light and press a button to get a green). 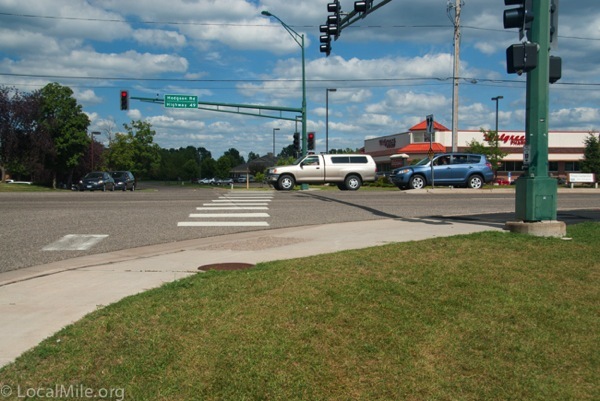 Crossing Wait TImes – Many intersections in Shoreview provide immediate crossing signals whenever possible. Others, however, require bicyclists to wait through an entire light cycle. Long waits can be quite frustrating when the vehicle lanes have a green in the same direction and there is no turning traffic. This gets compounded when a bicyclist is making a left turn (that requires two crossings and thus three light phases to complete the turn) and has to go through this at numerous intersections between their start and destination. Acknowledgement – Providing pedestrians and bicyclists with acknowledgment that their request to cross has been registered is another safety benefit. A countdown timer is even better. The button to cross Village Center Drive at Hodgson has been broken for several months—pedestrians and bicyclists should not have to continuously wait through two complete signal cycles to know if it’s broken every time they cross. Slip Lanes – Slip lanes encourage motorists to make fast right turns without slowing or stopping. While great for motorists in saving them two or three seconds on their trip home, they feel quite dangerous for people riding bikes. Construction, such as the above along Lexington Avenue in front of Target, presents several problems when not handled appropriately. First, a critical element of a functioning transportation network is reliability. If people cannot count on the network always being safely available, they’ll not use it (or use it as often). Second, and the most dangerous, is not providing a safe and clear alternative for people walking or riding along a closed path. If a portion of the path network will not be available an alternative should be provided. As a frequent bicycle rider and old enough to have driven through this and other areas for decades, I am comfortable detouring through the Target parking lot. 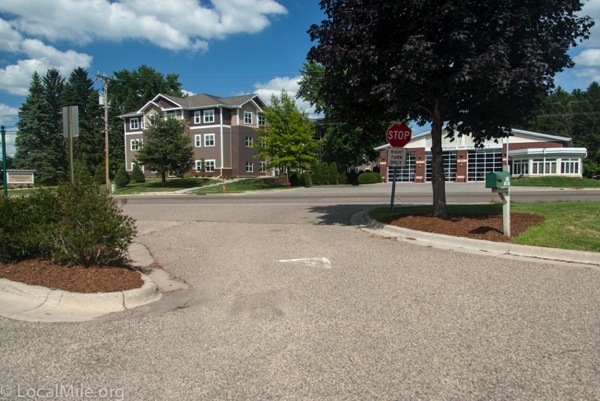 However, I still would have appreciated a marked and, ideally, barricaded, route around the construction since this parking lot is likely the most dangerous in Shoreview with many people driving quite fast and without looking for pedestrians and bicyclists. A couple of weeks ago when I was riding through here I encountered three young girls who were riding their bikes south from their homes north of 694 to Lake Josephine Park. They were a bit befuddled when they hit the north end of this closure with no indication of where they should go nor any safe path for them to travel on. It may not seem like a big deal to close a path for a few months in the middle of summer, but it is. While we’re looking at this crossing, note that, like others, there is little indication of the existence of a path. 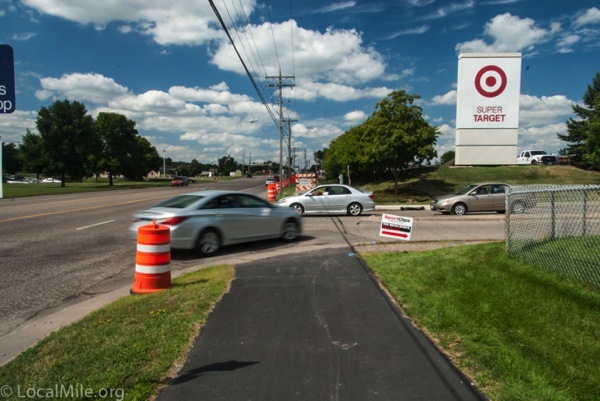 While motorists driving north on Lexington might be somewhat aware of the path, those leaving Target (below) have little to no indication of the existence of the path or who has right-of-way. Here I’m getting a slight bit picky, but this is still an important element and, that this is bubbling to the top, is an indication of how good Shoreview’s overall bicycling infrastructure is. There are two pieces; safety in parking lots, and parking for bicycles. Most parking lots in Shoreview are actually quite safe. Drivers go slow and overall do a good job of looking out for pedestrians and people riding bicycles. While bikeways through these might be nice, they are far from necessary. The primary exception to this is Target that has many drivers going quite fast and often without looking or stopping when necessary. A dedicated cycle track between the pedestrian sidewalk and vehicle lanes would be a significant safety benefit. Bicycle parking requires two things; a safe and appropriate place to park, and a safe and useable way to get there. Just as the city requires X amount of parking spaces for cars, it’s getting time to do the same for bicycles. Most bicycles, those with their own stands, only need a little space. Some need something to lean their bicycle up against. And many of both like to have a place to secure things with a cable or U-Lock. The space needs to be close to the riders destination without blocking people walking along sidewalks. Additionally, people need to be able to easily roll their bikes there. I’ve seen a few people struggling to get heavier city bikes up over a curb and in one case the woman gave up and just parked her bike in a car space—something she had a right to do, but wasn’t the best option. While some of these may seem like primarily convenience (or PITA) issues, they become a safety issue when bicyclists and pedestrians choose, for instance, not to wait for a crossing signal that taking too long, not to try to reach a button in a difficult location, or to ride in the street when there are too many obstacles such as bumpy driveway crossings. We can perhaps say tough-luck to adults who do this, but that’s more difficult with children. 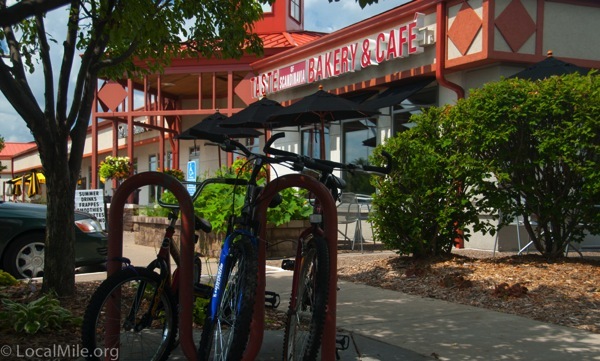 This entry was posted in Shoreview and tagged active transportation, bicycling, pedestrian, Shoreview, state of the city, walking by Opafiets. Bookmark the permalink.